....Historians have long debated whether Stonehenge was a full or incomplete circle, with some arguing a lack of stones in the south-west quadrant is proof it was never complete. A scientific paper which adds weight to the "complete" theory has been published in the latest issue of the journal Antiquity. The parch marks - areas where the grass does not grow as strongly as in other areas during hot, dry weather - were first noticed in July last year. Despite being one of the most intensively explored prehistoric monuments in western Europe, Stonehenge continues to hold surprises. 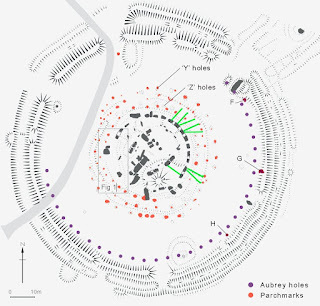 The principal elements of the complex are well known: the outer bank and ditch, the sarsen circle capped by lintels, the smaller bluestone settings and the massive central trilithons. 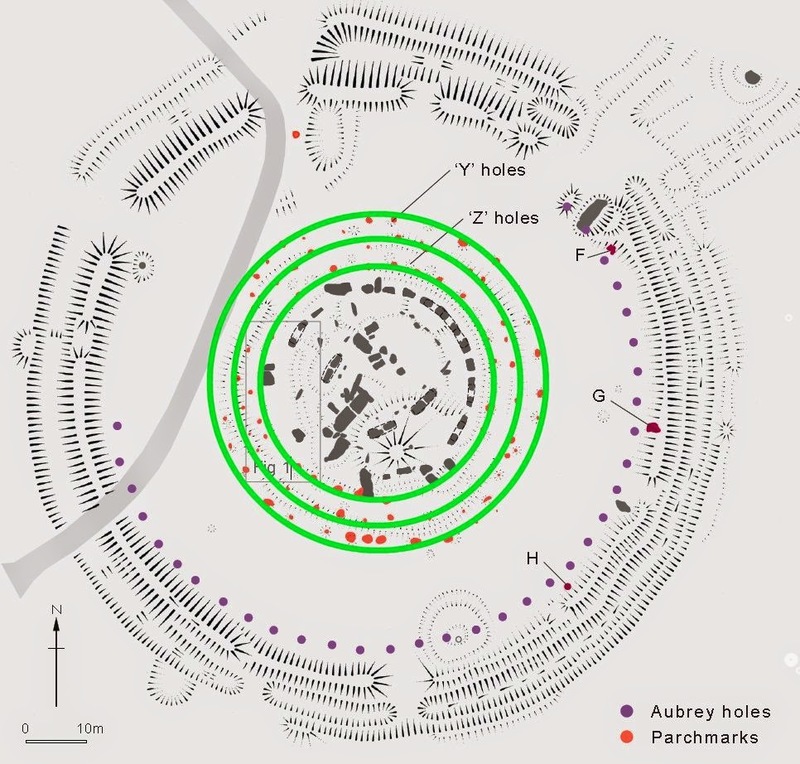 They represent the final phase of Stonehenge, the end product of a complicated sequence that is steadily being refined (most recently in Darvill et al. 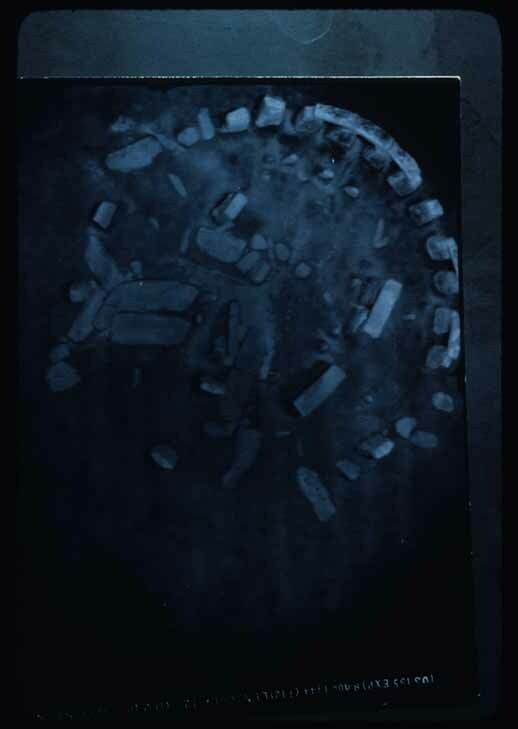 ‘Stonehenge remodelled’, Antiquity 86 (2012): 1021–40). Yet Stonehenge in its present form is incomplete—some of the expected stones are missing—and it has sometimes been suggested that it was never complete; that the sarsen circle, for example, was only ever finished on the north-eastern side, facing the main approach along the Avenue. A chance appearance of parchmarks, however, provides more evidence. The importance of paths and tracks within the formation of past landscapes has been much discussed within the recent literature (Edmonds 1999, Ingold 1993). It seems clear from this debate thai paths are not passive or simply functional landscape features. Paths and tracks make statements about signifìcant features within a landscape. and ultimately have a formative role in that they begin to guide movement. In highly charged landscapes, like that around Stonehenge, paths and tracks may have a liturgical role. They may guide the observer through a directed sequence of movements and spatial relationships, perhaps emphasising links with past landscapes, or relationships between groups, and indirectly restating the importance of social or power relationships through repetitive movement in a prescribed manner. Despite the importance of movement within a landscape archaeologists only occasionally have access to this information, and in the past have rarely attempted their reconstruction at a landscape level. Only in exceptional circumstances such as the preserved tracks on the Somerset Levels can we physically experience such paths, but it is intriguing to note that, however interpreted, these paths may also have had a ritual aspect through the deposition of specific objects including flint or figurines within the body of the track (Coles and Coles 1986). I eagerly await his new results, due 9th Sept I believe, I would like liturgical routes to have evidence of erosion or depositions along them, all we can do is wait to see. UPDATE - I am reminded in the comments of a previous Press Release from 2011. 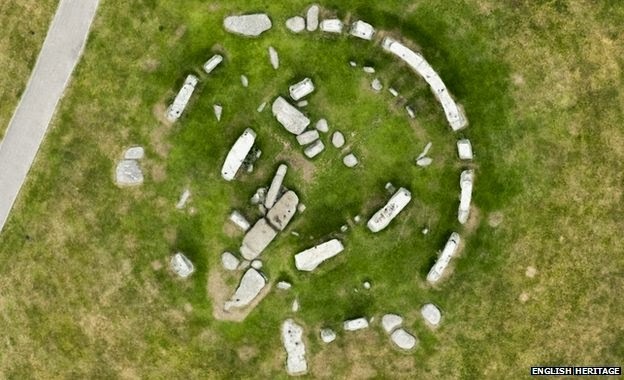 Lot of chatter online about a new film coming this autumn revealing new discoveries in the landscape at Stonehenge - http://www.smithsonianmag.com/history/what-lies-beneath-Stonehenge-180952437/ - http://www.dailymail.co.uk/sciencetech/article-2731994/Why-Stonehenge-built-Discovery-15-new-monuments-suggests-answer-lie-BENEATH-ground.html - much of it is based on Vincent Gaffney et al's research. Click to enlarge - but follow link below to get full paper. The Missing Stones - Did they look like this? Pleased to see a reconstruction of the missing stones 17, 18, and 19 and 20 will be featuring in a new film about Stonehenge. October Films has gained exclusive access to the international team of scientists conducting the most exciting and far reaching archaeological project at Stonehenge since the 1960’s. 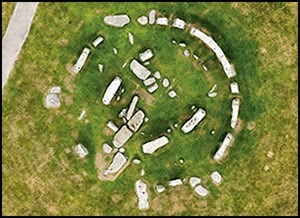 The series will combine new archaeological evidence from the international survey, drama reconstructions and state-of-the art CGI to produce the most complete and interconnected picture of the how the whole site looked in its heyday; revealing Stonehenge to be a Neolithic Valley of the Kings. 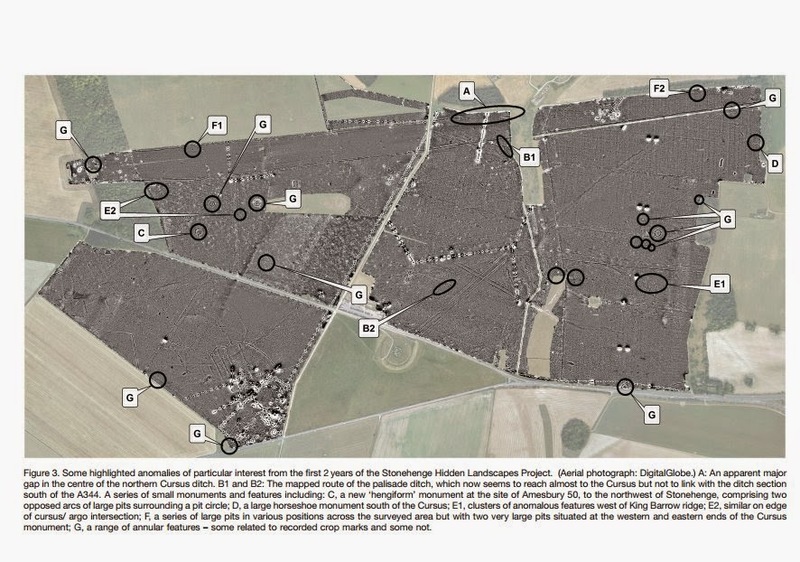 Integrated non-invasive survey in the Stonehenge ‘triangle’, Amesbury, Wiltshire, has highlighted a number of features that have a significant bearing on the interpretation of the site. Among them are periglacial and natural topographical structures, including a chalk mound that may have influenced site development. 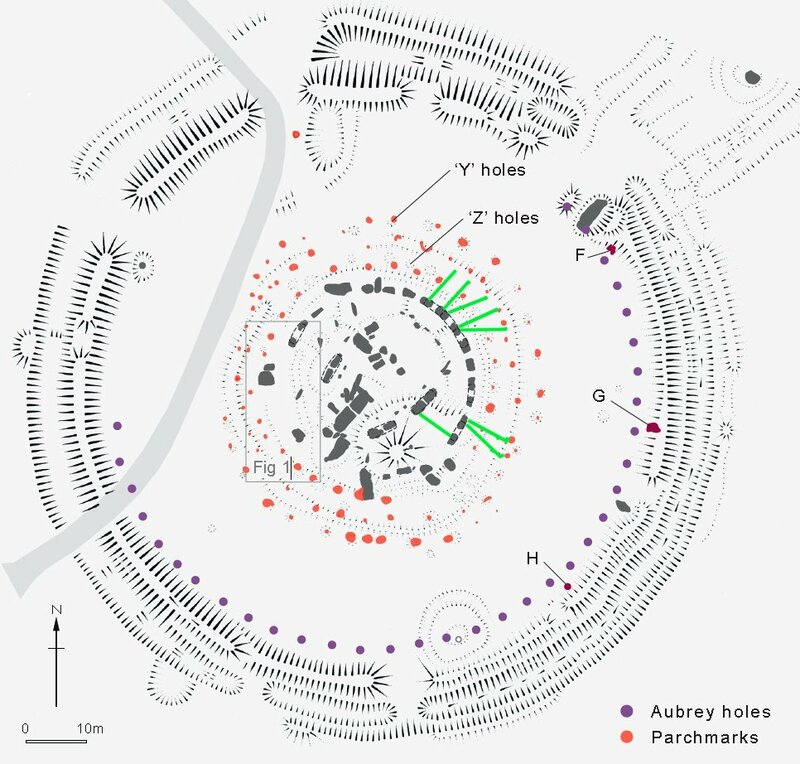 Some geophysical anomalies are similar to the post-holes in the car park of known Mesolithic date, while others beneath the barrows to the west may point to activity contemporary with Stonehenge itself. Evidence that the ‘North Barrow’ may be earlier in the accepted sequence is presented and the difference between the eastern and western parts of the enclosure ditch highlighted, while new data relating to the Y and Z Holes and to the presence of internal banks that mirror their respective circuits is also outlined. Lots of fascinating stuff - get a copy. Authenticity in conservation is an outmoded sacred cow. The origins and use of conservation principles and practice from the nineteenth century to the present day are charted in this volume. Written from the perspective of a practitioner, it examines the manner in which a single, dominant mode of conservation, which held sway for many decades, is now coming under pressure from a different and more democratic heritage management practice, favouring diversity, inclusion and difference. The author blends case studies from Ireland, Cyprus and England with examples from current practice, community heritage initiatives and political policy, highlighting the development and use of international charters and conventions. Central to the main argument of the book is that the sacred cows of conservation - antiquity, fabric and authenticity - have outlived their usefulness and need to be rethought. Dr Keith Emerick is an English Heritage Inspector of Ancient Monuments in York and North Yorkshire; he is also a Research Associate at the University of York. I think I prefer "antiquity, fabric and authenticity" to "democratic heritage management practice, favouring diversity, inclusion and difference"; but then I'm old fashioned, and can't afford the £60 to buy the book to be converted. 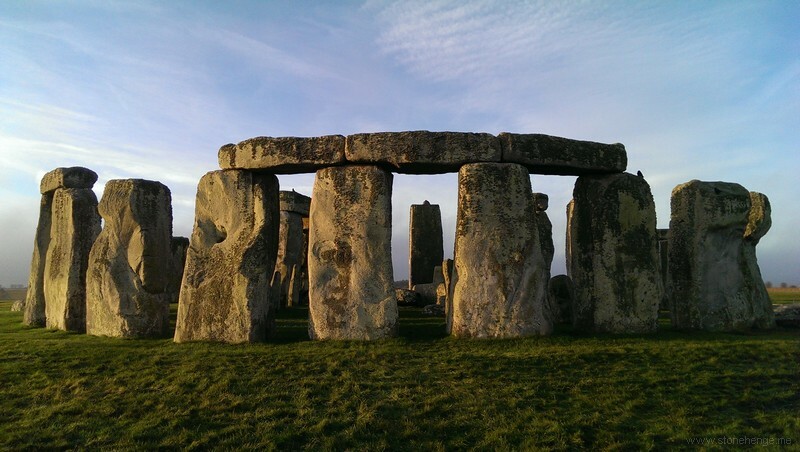 Archaeological research at Stonehenge (UK) is increasingly aimed at understanding the dynamic of the wider archaeological landscape. Through the application of state-of-the-art geophysical techniques,unprecedented insight is being gathered into the buried archaeological features of the area. However,applied survey techniques have rarely targeted natural soil variation, and the detailed knowledge of the palaeotopography is consequently less complete. In addition, metallic topsoil debris, scattered over different parts of the Stonehenge landscape, often impacts the interpretation of geophysical datasets. 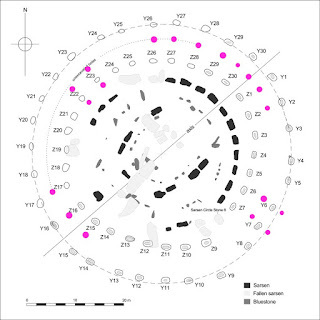 The research presented here demonstrates how a single multi-receiver electromagnetic induction (EMI)survey, conducted over a 22 ha area within the Stonehenge landscape, offers detailed insight into natural and anthropogenic soil variation at Stonehenge. The soil variations that were detected through recording the electrical and magnetic soil variability, shed light on the genesis of the landscape, and allow for a better definition of potential palaeoenvironmental and archaeological sampling locations. 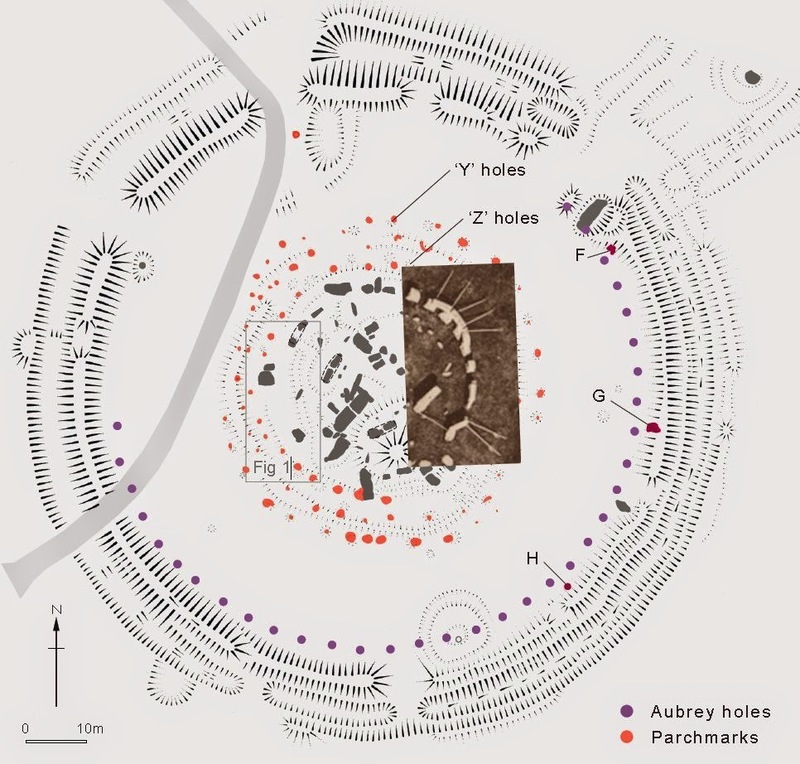 Based on the multi-layered dataset, a procedure was developed to remove the influence of topsoil metal from the survey data, which enabled a more straightforward identification of the detected archaeology. The results provide a robust basis for further geoarchaeological research, while potential to differentiate between modern soil disturbances and the underlying sub-surface variations can help in solving conservation and management issues. Through expanding this approach over the wider area, we aim at a fuller under-standing of the human-landscape interactions that have shaped the Stonehenge landscape. Some nice results, showing up a couple of hengiforms for instance. Songs of the Stones - The acoustics of Stonehenge - pseudoscience? 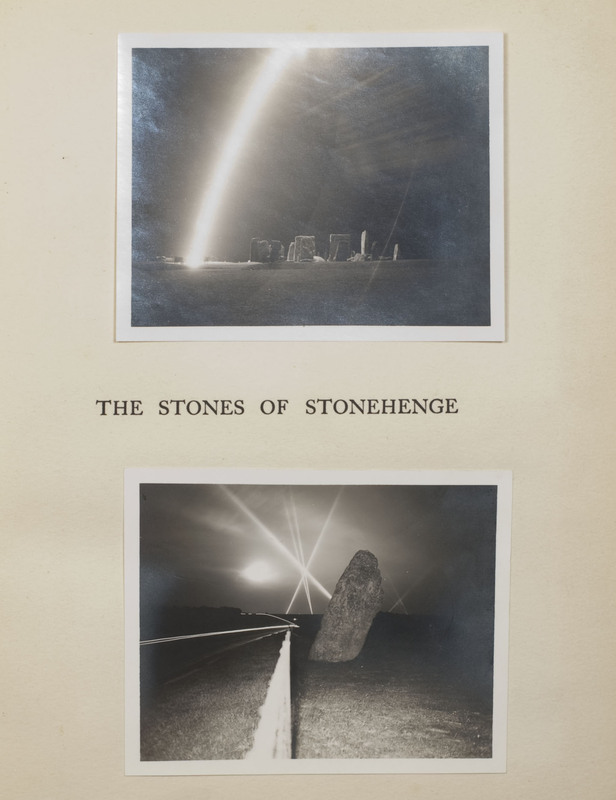 "concludes that the sonic features of Stonehenge were noticeable and significant, and that it is likely that they were a part of the ritual culture of the site." Pseudo science in British archaeoacoustics: Rupert Till's interpretation of the perception of sound. lead to erroneous conclusions and misinterpretation". perceived differently, even though they are essentially the same thing' (Till 2010, pg 9). waves cannot be construed as being similar to the frequency of a perceived rhythm.
' Pseudosciences never produce new insightful knowledge, they are circular and static. Stonehenge has a 'resonant frequency ' of 10 hz, possibly linked to alpha wave patterns. alpha wave pattern... ' (Till 2010 pg 7). at Stonehenge based on the geometry of an open ended cylindrical tube is unhelpful. echoes (in a large space) or resonance/ reverberation ' (Till 2010). 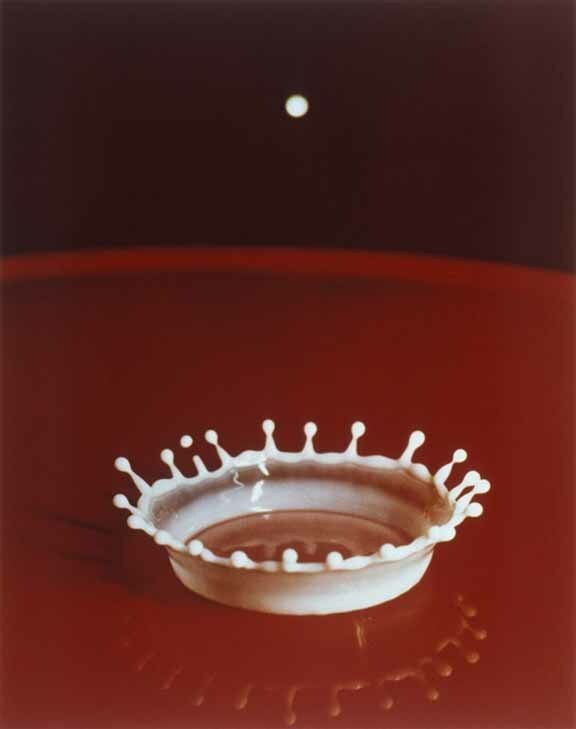 environment with few reflections and short reverberation times (Thomas 2007). scientific claim could appear perfectly reasonable' (Braithwaite 2006). thinking (7th Edition), New Jersey. Pearson Prentice Hall. Campbell M. and Greated C. 1994 The Musician's Guide to Acoustics. Oxford. Publisher. Carroll, R. T. (2005) Becoming a critical thinker. A guide for the new millennium (2nd Ed). 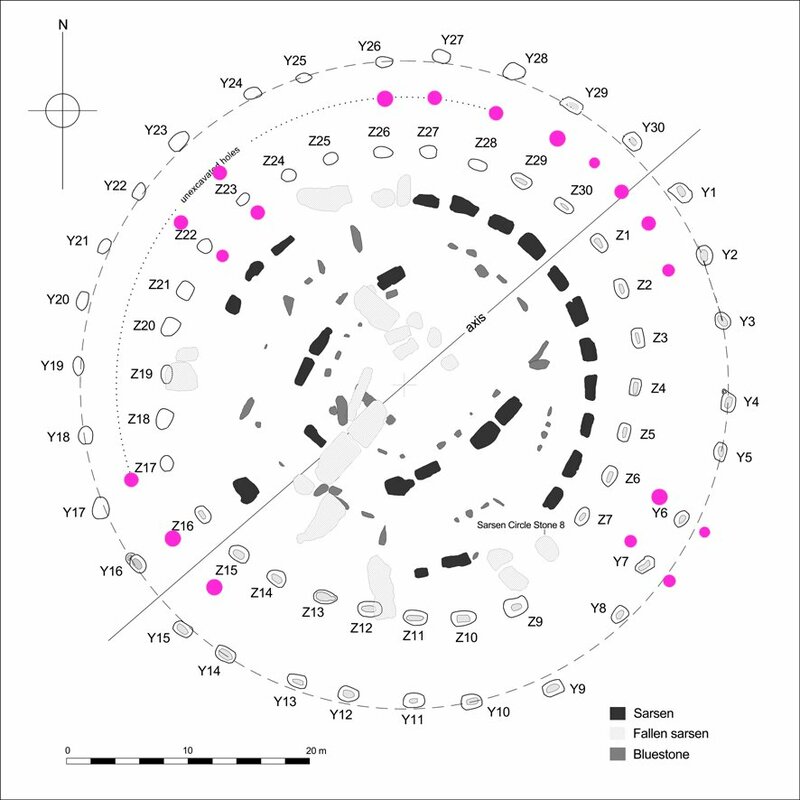 Till R 2010 'Songs of the Stones : An Investigation into the acoustic culture of Stonehenge'. Lett, J (1990) A field guide to critical thinking. Skeptical Inquirer (14), 2, 1- 9. Shermer, M. (2002) Why people believe weird things. New York. Henry Holt & Company. Thouless., R. H. (1968) Straight and crooked thinking. London, Pan Books. Analysis of Sound and Light. Whyte, J. (2005) Crimes against logic. New York. McGraw-Hill. How to construct a level sarsen circle with boning rods. The stonemason who is building the Long Barrow at All Cannings explained to me how easy it would be to set out the sarsen circle and get it level. Before laser levels, and still widely in use, on building sites boning rods were used. These are the T shaped wooden stakes you will have seen on the edges of sites. They don't actually need a T shape, though it helps. Just posts that all have an equal length marked from one end work. So make eight five foot long straight posts with a pointed end and a flat end. Lie them side by side and mark all of them at four feet from the flat end with a line. Now on a wet autumnal day decide where you want the centre of your circle to be. Scoop out a shallow depression, six feet in diameter but only six inches deep or so and puddle the clay soil by dancing around on it. You may find a greasy auroc skin helps line the pool. If it doesn't rain enough fill the pool with water. Around the edge of the pool space your eight posts equally and bang them into the ground until the marked line is level with the water. You now have a ring of posts whose tops are level. Looking across from post to post it is then easy to set up other posts so their tops are also level. And then you can decide that the top of your sarsen uprights should be so many feet above that level, and you can measure down into the excavations from your level to get the depth of the hole right for the length of the sarsen you have to hand. As he says, simples. But I hadn't had it explained to me before so it had never occurred to me that that was how it could be done..